Karnataka's bowlers wrapped up Tamil Nadu's lower order in a hurry to seal a 14-run first-innings lead, and their batsmen drove home the advantage to leave them in a dominant position going into the final day. With Robin Uthappa and Mayank Agarwal laying the second-innings platform with a 163-run opening stand, Karnataka ended the third day 263 ahead with six wickets in hand. Starting the day 240 for 5, trailing by 50, Tamil Nadu were bowled out for 274. The slide began when their captain R Prasanna, who had added eight runs to his overnight 51, was run-out following brilliant work from the wicketkeeper CM Gautam, who picked up the throw and flung himself at the stumps to find the batsman short of his crease. The last five wickets added only 19 runs. Tamil Nadu had reason to feel aggrieved with the umpiring. Kaushik Gandhi and Dinesh Karthik had already fallen victim to poor decisions on the second day, and their innings ended when L Balaji, batting on 11, was given out lbw to Sreenath Aravind when the ball clearly looked to be heading down the leg side. Having secured the lead, Karnataka extended it at a rapid clip, with the opening stand coming at over four runs an over. Uthappa was first to go for a 117-ball 76, before Agarwal followed after the addition of four more runs to Karnataka's total, run out for a 113-ball 80. Kunal Kapoor didn't last too long either, and the fall of three wickets for 11 runs opened the door a fraction for Tamil Nadu but Manish Pandey and Karun Nair shut it quickly with a 59-run fourth-wicket stand. It ended with minutes left to go for close of play, M Mohammed bowling Nair for 35. 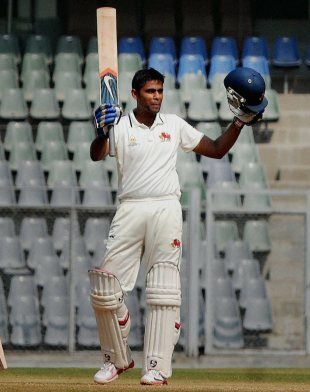 Suryakumar Yadav notched his second 50-plus score of the match, muscling a lively 115, but a five-wicket haul from the medium-pacer Ram Dayal helped bowl Mumbai out for 254 in the second innings, meaning that Jammu & Kashmir needed 237 to open their Ranji Trophy campaign with a win. Mumbai began the day at a tricky 66 for 4, but Suryakumar muscled his way to a fifth first-class ton, which included 17 fours, to lead a recovery. However, Dayal (5 for 75) and Umar Nazir (4 for 49) dealt blows at regular intervals to dismiss the hosts for 254. Besides Suryakumar, no other batsman was able to cross 37. J&K lost Adil Reshi for 12 in the 10th over of their chase, but Shubham Kharjuna and Bandeep Singh ensured there were no other casualties, and took the team to 58 for 1 at stumps, meaning that the visitors need another 179 runs for a famous victory. Half-centuries from Mohnish Mishra and Harpreet Singh revived Madhya Pradesh from a poor start to their second innings after they had conceded a 99-run first-innings lead to Railways at the Karnail Singh Stadium. MP lost its openers with only 21 runs on the board but Mishra stemmed the slide with a 93-run stand for third wicket with captain Devendra Bundela. The partnership also helped the team erase the deficit. However, both batsmen were dismissed with the lead standing at 40. It was Harpreet then who lifted the team further to safety, taking the lead past 100. He was dismissed for 69 off 107 balls four overs before the close of the day. Earlier, Railways had managed to add only 27 runs to their overnight total of 253 for 7. Arindam Ghosh was dismissed for 120 by Puneet Datey in the 104th over. Datey struck again next ball to complete his maiden first-class five-for and Ishwar Pandey wrapped the innings in the next over with the wicket of Anureet Singh. Bengal bowlers, led by Ashok Dinda's burst with the second new ball, dismissed the remaining seven Baroda wickets to help Bengal earn a healthy 101-run first-innings lead. Despite the good work of Bengal bowlers, the penultimate day's play belonged to Baroda debutant Deepak Hooda, who scored a stylish century at the Reliance Stadium.